We pick up after a two-week hiatus, and we’re joined by Leshar, a lizard-man former gladiator and fighter on behalf of Mitra.This is +Tim Shorts‘ new character, and he seems a fighter of some ability. We learn from him that the revolt in City State was quite real, but that the Regent has pretty much got the City-State buckled up, but he’s turning his attention to fighting Dracolindis. That pretty much leaves us on our own. To interrogate, we have Halia Thorton, Settite and the person that runs the miner’s guild, and Sir Varius, general thug and horse lord of Highgarden. The mayor, Arno, left behind something that might prove useful. It’s 2′ long, 8″ high, filled with writing implements. And the Seal of a Magistrate of City-State. Hrm. We talk about fake credentials, but hey – Paladin. We have a hungry lizard man, a priest with a thirsty blade, and a Paladin whose idiom is pretty direct. What could go wrong here? We eschew obfuscation, and make a beeline to the Highgarden Manor. We elect a pathway to enhance our sneakitude . . . but fail miserably on a series of awful rolls. As we go, we pass an inn covered in turtle skulls. The innkeeper asks us what’s going on, we say we’re headed to the Manor. “Sir Varius isn’t there,” she says.“I know,” says our Paladin. Not necessarily a master of the reassurances, is he. Truth, not comfort. There are people going about their daily lives inside the Manor. We knock. A bar is lifted, and a woman says “YEEEP!” and flees in terror. No worries, we say. The reptile man comes in peace. Really. Vognur rolls a 1, and Leshar notes that he could have bit off her hand and ate it and gotten a better reaction. We speculate that Vognur may have met that maiden before, explaining the reaction. “Who dares enter here? You’d best be gone or you’ll be in no end of trouble.” There’s some shouting and a scream, as the people inside engage in a vigorous religious discussion. We kick in the door. There are three women huddled over a trap door leading down. They see us and they back away. There appears to be the steward of the manor, laying in the basement with a broken neck, dead. Leshar the very violent reptile-man says: “Was this your first kill?” He sounds very approving. We go in, and see the broken body of a priest of Mitra; he’s barely alive. The paladin lays on hands, and he revives, says “Praise Mitra!” and falls asleep. The household gathers, and we get it sorted out. The manor servants and occupants do not look healthy or well-off. The stores, upon examination, shows food of middling quality for Sir Varius, and utter crap for everyone else. We encourage the remainder to make a meal of Sir Varius’ stores, for themselves. The priest awakens, and we find he is Elder Gefgist. We get his story. The messenger came. Elder Gefgist was listening with the other townsfolk. Some of the peasants, in league with Sir Varius, informed. The visiting elder escaped, but Elder Gefgist was taken, and tortured. But Sir Varius couldn’t even get torture right. We then search the rest of the house, looking for papers and information. The rooms seems to be of common size. It looks like Varius tried to get involved in a lot of things, but not even the bad guys wanted him on his team. We look for ties to Hilda, and find it – but she’s not that interested in this thuggish knight as a partner either. There is one thing of interest – there is one connection to a Master Palad – a mercantyler (merchant) in Tain – about an interesting proposition. But alas, no details on the proposition itself. But a list of five people, including Herone. Ah, ha. We continue to search the manor, and our eagle-eyed Lizard rocks it. 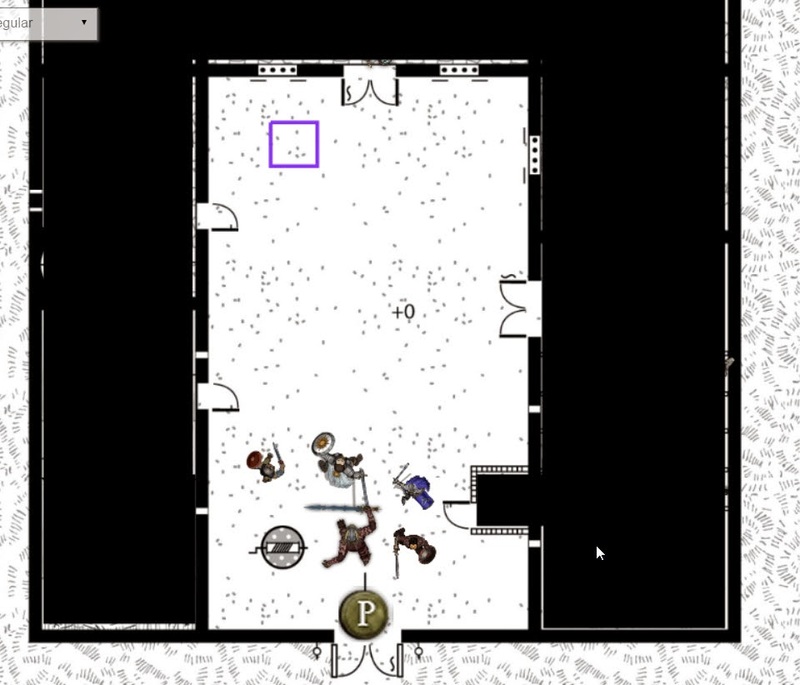 As we’re searching, Leshar wanders out carrying a large box, for which we find a key on the dead body of the Steward. It contains 500d and 10 gold crowns, plus the charter for the manor. Elder Gefgist gives us each 1 gold crown, worth 320d each. We eat, offer blessings to Veritas and Mitra, and then we have to decide what to do. There’s one yeoman left, who promptly surrenders and joins us, and six militia. They all have harvest to bring in. 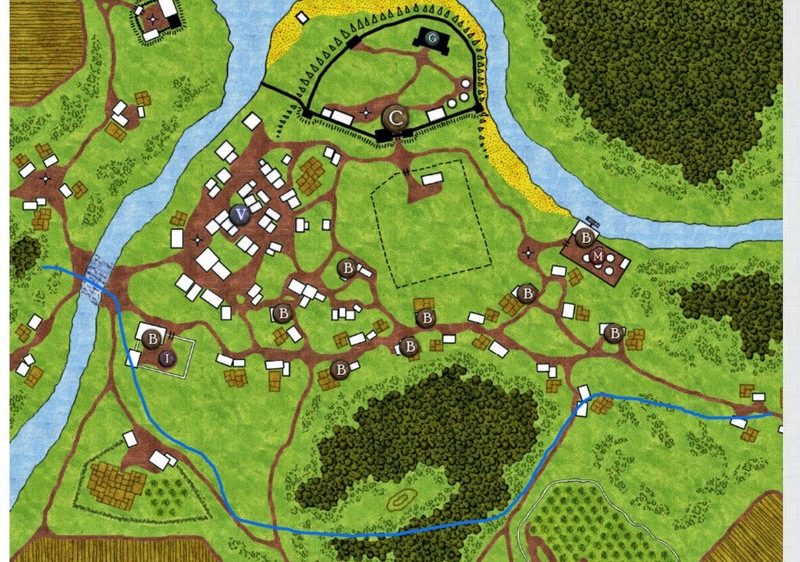 We also remember that Tormar is the village/manor of the knight we captured and ransomed. But wait – we still need to drop off the gear in Tain. We probably have until mid-month before we have broken any pledges. But watch out for trolls to the northeast, orcs to the southeast in the woods, so these villages must stay protected. And of course, there’s a dragon at Thunderkeep (T), and the keep of Valion between us and Tain. We have several missions, all of which seem to take us to Tain. Sir Melius, though – his rep among the people of Highgarden is better than Sir Varius, and way better than Sir Colin. 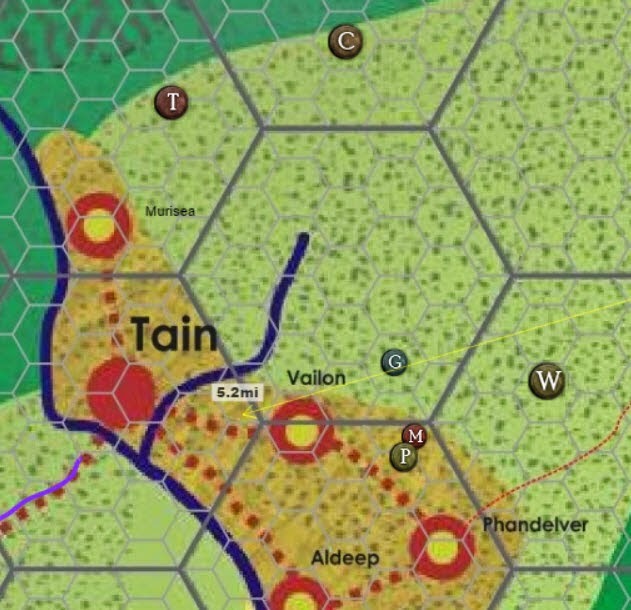 We decide to head over to Lervin, where there’s Sir Tunnon, who is known to be Mitran, and so we try and chat him up, hoping to enlist him and delegate settling Mardan, since the loss of Sir Colin may have upset things. We see more-alert militia at Lervin, and they’ve set up a barricade; troops file on the bridge. We approach openly, and by the time we hit the ford, Sir Tunnon and four militia approach. The townsmen in the field seem mostly organized. He recognizes Leshar, but not Elder Carmina. He asks us what we want, and we tell him it’s to chat. We accept. We tell him that Phandalin has revolted against the Overlord and declared for Dracolindes ad Mitra. This caused Sir Varius and Sir Colin to try and take Phandalin. 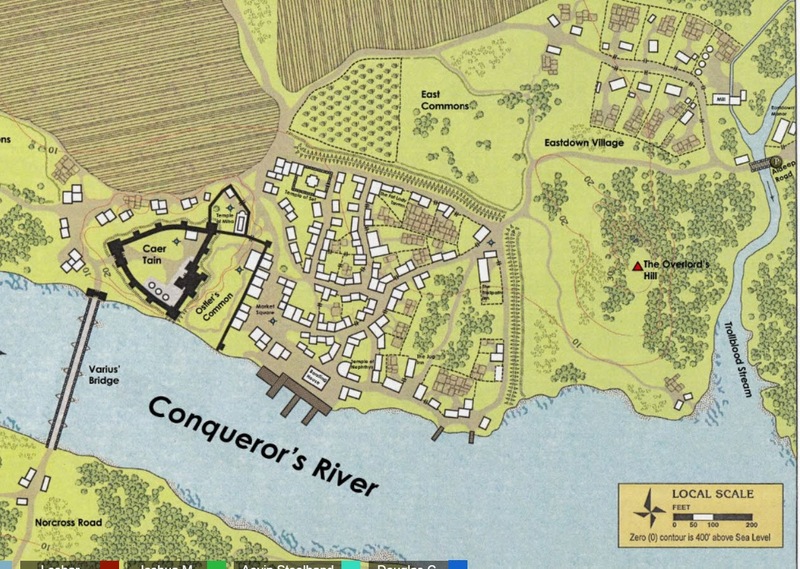 They fell in battle, killing Colin and taking Varius prisoner. And oh-by-the-way, Sir Melius of Tormar attacked us and ransomed his armor. Carmina is on his way to Tain, with messages to the Bishops and to drop off the armor. Sir Tunnon says that the magistrate of Valion must have screwed up; there’s a lot of fighting up that way. There were a bunch of troops tried to march to Lervin (oh, that was us too), and so the Lervinites were prepared for trouble. He thinks that this is all good news. He holds out a message from Baron Theodar of Greenstream. He wants to gather those sworn to the cause of Mitra to join him there. Hrm. Well, our desire is to see that the people of this area are at least safe, and so it occurred to us that whatever we could offer up for mutual defense and protection would be good. He asks us who we left in charge – the Elders of Mitra in Phandalin and Highgarden. Tunnon is heading down to Greenstream. The reeve has things well in hand. We could come with him to Greenstream. 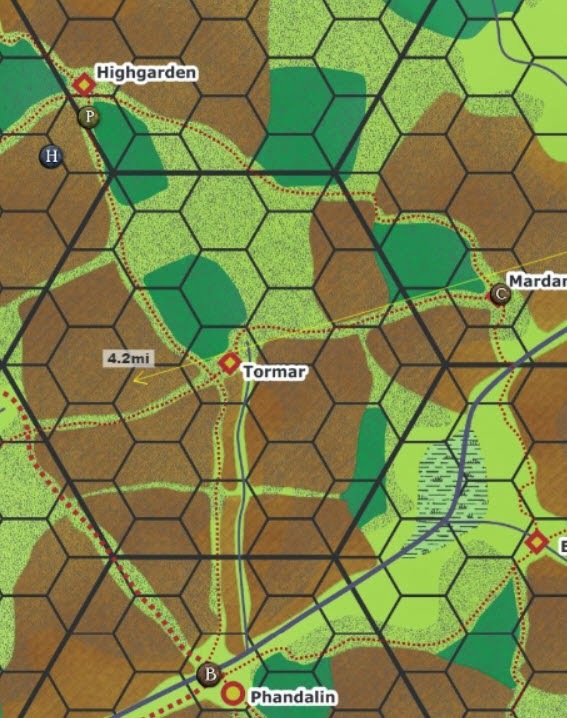 We decide to head to Tain, deliver the armor, and deliver the Bishop’s messages. Tunnon reminds us that being caught in Mitran robes. He also advises us that as a group, we’re a major military force. We head off to Tain. We crest the ridge on the way to the keep of Valion, and see a pillar of smoke rising above the valley. The keep itself is burning, and there are other buildings on fire or burned (B). There are people around, tending chickens – any battle is quite over, perhaps. The keep is just a burned-out shell. Vognur walks up to the first peasant he sees to ask what’s up. Mostly they back off, but two stand firm, and we come up holding out empty hands. We ask what happened, other than the obvious – a battle. The magistrate said that we are now under the authority of Dracolindes; the local horse-lord knights took exception. The horse-lords are at the gate, and the harvest must continue. What happened to the forces of the Dracolindes? He received a message from the Baron of Greenstream, so they left. They hope that the guy that freed the starving village (Leshar ducks his head) will save them too. The question is do we slip across the river in the night, and not get entangled in a fight? We take a wide berth to direct line-of-sight to the keep. As we approach the bridge and ford, a single guy on horseback rides out to investigate us. Leshar starts walking directly at the horse lord. He fires two bowshots at Leshar (and rolls a 1!) and we decide not to return fire, and move along. We pause here, having done the entire session without smiting anyone. We’ll have to make u for it next turn. Tain awaits. 250xp were awarded. A lot of plot development this time, but still, we had to decide which of many forks to take. Tain seems the best bet, as we have concrete things to do there. Still, the manor of Sir Colin and the meeting with the Baron at Greenstream loom large on our minds.